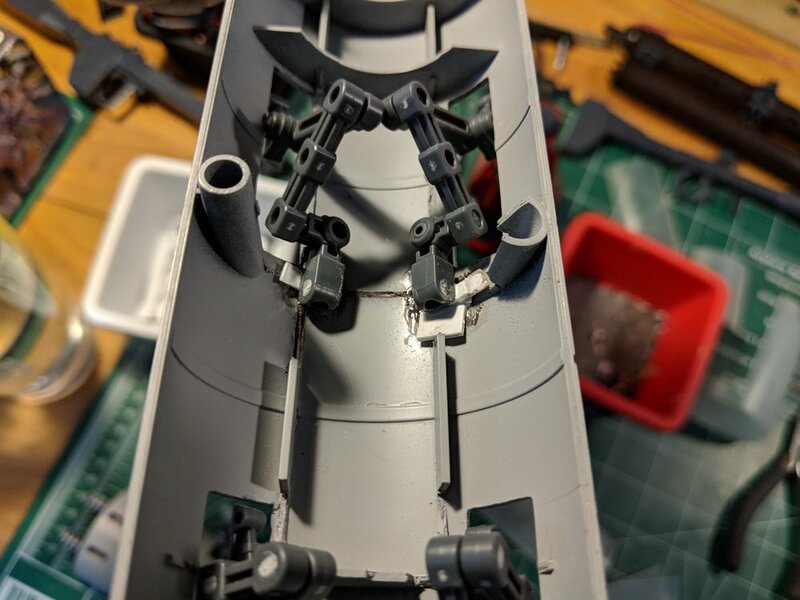 When I was planning modifications for the Psycho Zaku I wanted to fill some space between the fuel tanks in the back. They're already huge, but there's a bit too much empty space. After trying to scratch build some arms myself, I decided to go with some articulated arms from Kotobukiya I found here. I had to use small pieces of pla plate to glue them in, which looks messy but will be hidden away so no big deal. Heres what the inside looks like. Lots of glue and little shims to attach and make them even with the surface. Here is a mock up of what I'm going for. The fuel tank and panels will be painted black, and the arms metallic with the piston details painted red and silver. It's finally coming together and I'm really excited to see it done! Here's what the arms look like when folded in, sitting flush with the surface. I also filled in the detail lines on the large panels. When I moved I managed to lose a tiny piece that attaches the front skirt armor to the body, so I had to improvise. Here's the piece I lost. I was able to fashion a replacement from unused pieces of the kit and a piece of runner. 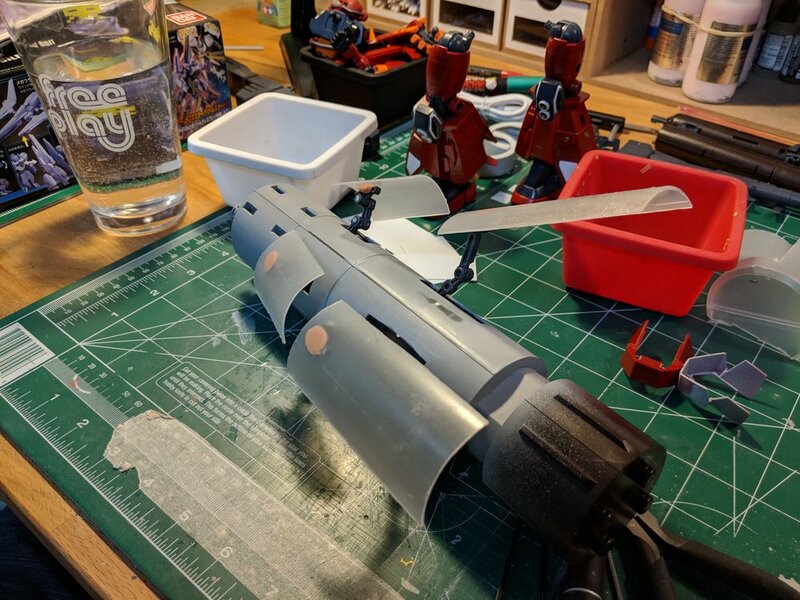 A little snip snip, some glue, trimming and sanding and voila, a new armor connector! 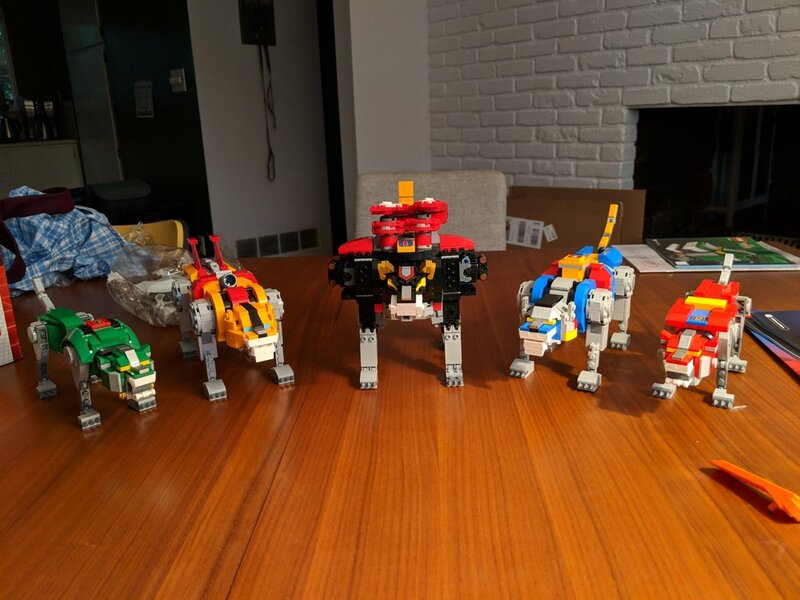 I also built the new Lego Voltron set with my wife. It's AWESOME! I'd love a model kit of classic Voltron I can build and paint, but for now this is more than enough. It's pretty solid and sturdy in mech mode too!